Housed in the former mill, the restaurant can accommodate up to 60 people. Ethnic furniture is combined with traditional furnishings, creating a pleasant and relaxed atmosphere. This historic and prized volticciole ceiling dates back to the early 1800’s. The bar in the restaurant offers the opportunity to sample local wines, cocktails and of course our beloved cappuccino. The restaurant looks onto a large terrace where you can have breakfast or dine by candlelight. “While we feed your body, the beautiful countryside and distant village, nourishes your spirit!” Lose yourself in natural beauty, brilliant sunsets usher in a night skies full of stars. We have a holistic view of hospitality, and especially food. That is why, our cuisine is closely linked to the local territory and its products. Good health, comes from using the fresh natural resources that surround us and using them with intelligence and love. We offer authentic local Mediterranean dishes. 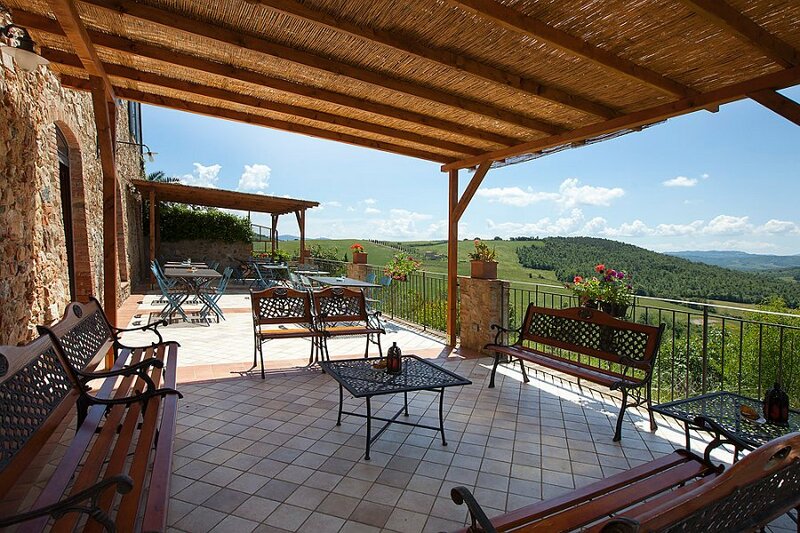 We are recognized by UNESCO as a World Heritage Site focusing on Tuscan traditions. Rediscover ancient delicacies bursting with flavors, from the simplest to the more elaborate Tuscan recipes. We would like you to experience the magic that made the famous 17th century politician Bettino Ricasoli say, “… a cuisine created by the poor that delights kings.” Walk with us through the paths of tradition, the seasonal variations, creating dishes with wild herbs and spices, rosemary, sage, basil, “catmint” … the so-called erbucce. Even the traditional meats of the land, we offer many tasty varieties from Chianina, the Cinta Senese (an ancient breed of pig), a species of boar that inhabit the surrounding woods. All dressed with the best regional olive oil and accompanied by carefully chosen local and regional wines.